﻿ Design a Fundraising Event Email that Attracts the Right Crowd » Red Mango Marketing! Any email your nonprofit organization sends will have a similar message, to attract engaged volunteers and passionate donors. The message of your email can become even sharper when you focus it on promoting an upcoming fundraising event, making the email more effective at inspiring your audience to act. To start building your volunteer base and attendance list, design an email that helps your nonprofit organization attract the right people to exceed your fundraising goals. Everyone has the power to care about a worthy cause, but these days people are flooded with important worries. Your headline, as well as your subject line and preheader, all work together towards the same cause: to grab their attention and make them read your email. They should all point towards making potential volunteers or donors prioritize your cause now and keep reading to learn how to get involved. Say your nonprofit is organizing an event to groom homeless dogs to help them find a home. Your headline should reiterate the event’s importance and convince volunteers/donors to care at the same time. You could A/B test two different headlines on a subset of your audience, for example, “Shave a Dog to Save a Dog” and “Give a Dog a Bath to Give a Dog a Home,” then send the winning headline to the rest of your email list. There’s no better tool to the nonprofit than photography. The right photograph can help both convey the importance of your cause, and illustrate the message of your email with just a look. Instead of scaring your audience to act, look for images that will instill hope, making them feel empowered to instill change. If your nonprofit is throwing an event similar to one thrown previously, you have a treasure trove of images to draw from. Using before and after photos of homeless dogs ready for adoption after having a bath, for example, can illustrate the difference of such a simple act. The simpler the volunteer effort, the better your images can explain why you’re asking your audience to offer their time. Once a carefully crafted headline has grabbed their attention and the right photo has tugged at their heartstrings, you need a clear message that helps your audience act. The text and call to action button of your email should compel your volunteers or donors to participate in your fundraising event. How many homeless dogs are there in your community? Why are they unsafe on the streets? How can people help them find a loving home? Imagine talking with one person on your email list face to face, and anticipate the questions they would likely ask you. Answer those questions, and then include an obvious call to action button that directs them to a donation or volunteer sign up page. Your email doesn’t isn’t about attracting anyone to your event, but attracting a crowd of engaged volunteers and passionate donors to help your nonprofit organization succeed. Sharpen the message of your email to drive your audience to action with a design that helps you exceed your fundraising goals. 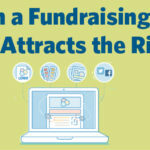 The post Design a Fundraising Event Email that Attracts the Right Crowd appeared first on Constant Contact Blogs. This entry was posted on Thursday, July 5th, 2018 at 8:00 am	and is filed under Email Marketing, event promotion, News & Updates, Nonprofit. You can follow any responses to this entry through the RSS 2.0 feed. Both comments and pings are currently closed.